Managing a Dementia Patient: Are You the One who is Angry? Managing an Alzheimer’s or Dementia Patient: Are You the One who is Angry? A common emotional reaction to stressful situations is anger. Some research theorizes that anger can increase the risk of heart disease. Dr. J.E. Williams directed an influential 5 year study on this finding by researching approximately 13,000 men and woman with no prior history of heart disease. Researchers found a significantly higher rate of heart attacks among the participants who exhibited an angry disposition. Among the participants with normal blood pressure, the high-anger subjects experienced almost three times as many coronary events as the low-anger subjects. I entertain this subject in an effort to help all of us Type A personalities who are caregivers. 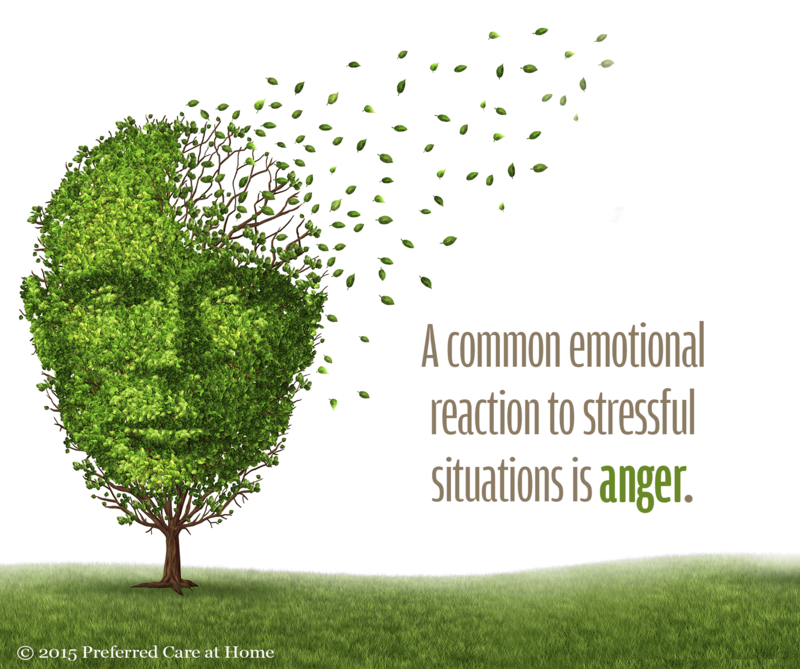 When dealing with an angry patient or loved one with Alzheimer’s disease or dementia, it may be difficult not to mimic that aggression and respond in anger based on our personality orientation. It goes without saying, but we don’t want an anger response to increase our risk of heart disease or to affect our relationship with our loved one. Here are a few ideas from the Alzheimer’s Association that may help us prevent an incident because of course, an ounce of prevention is worth a pound of cure! Try to identify the immediate cause of the anger. What happened right before the reaction that may have triggered the aggression? Rule out pain. A person with dementia or Alzheimer’s who is not feeling well can act aggressively due to pain. Focus on feelings and not facts. Don’t try and take the upper hand by focusing on the details of what happened but look for the feelings behind the actions. Try not to mimic their anger. Speak in slow soft tones and don’t allow your frustration to show. Limit distractions and try a relaxing activity to soothe the patient. Decrease the level of danger by stepping back and taking a deep breath. Avoid using restraint or force. Lastly, and very important. Share your experience with others. Seek out other caregiver, care providers, or support groups to learn what strategies have worked for them and to help you reduce your anger response in coping with your Alzheimer’s or Dementia patient.